Sakes alive—for all the intemperate, interminable Deutsche Grammophon box sets no one plays or can play. For all the love of Mahler. For each new lubricious, new-release memoir or biography we said “oh, okay, hrm” to and then, creepered out, set down. For all those crappily ambitious revivals of Mass the critics have had to fidget through. For that very last time we played “Big Stuff,” for sentiment’s sake. Yes, for all those things and more, it seemed perfectly unfair that despite living in hot n’ gritty Manhattan, we’d have to pack our inhalers and roll out to sunny, lakeside Cooperstown for the sole item our Bernstein Centenary seemed to be missing: a peppy, exuberant, winning production of West Side Story, the musical. Honoring the naked party host revered American composer with a 14-performance run that extends through August 24, Glimmerglass is now putting its stamp on Bernstein’s tritone-laden saga about gangs and the adults who hate them. The show, though taxing as ever to pull off, remains a stunner, a moving tribute to the quartet of gay Jews who in 1957 brought high art—operatic high notes! symphonic interludes! ballet!—to the Broadway stage. Yet from the depths of Sondheim’s dungeon, their ghosts continue to haunt the production. 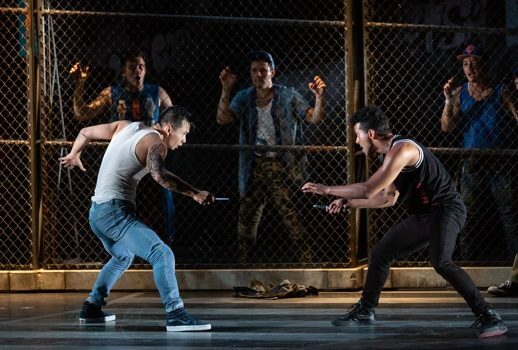 West Side Story, for all its achievements, has remained a museum piece as well as a classic, tethered adamantly to its beboppin’ original form by the composer’s neurotic estate and the Robbins Foundation—with nary a key change or added rumble leap allowed. To speak of this facsimile revival “based on a conception of Jerome Robbins,” as “directed by Francesca Zambello,” would therefore be akin to lauding the curator of the latest Michelangelo exhibition for his stellar work with the chisel, or to complimenting your mother-in-law’s chewy fudge brownies. Better, then, to evaluate what Glimmerglass’ young hoofers have done with their modest wiggle room. In this iteration, rival posses—the social-disease-ridden Jets vs. tropic-disease-fearing Sharks—are set against the loosely Eighties-ish, Fifties-ish, graffiti-enhanced urban landscape of set designer Peter J. Davison. Outfits, by Jessica Jahn, play up the hot/cold aesthetic of the opposition, with the plot’s central youngsters sporting sea colors vs. muy caliente ketchups and mustards. This cast is led by deep-voiced Brian Vu, who plays Riff, and the Bernardo of ballerino Corey Bourbonniere. Nether quite pulls off a believable “Daddy-O!” or “Womb to tomb,” although both arm their characters with a foreboding gruffness that was credibly violent. Vu’s leading of the Jets’ fugal anthem “Cool” is a particular standout; Bourbonniere’s take on Robbins’ athletic off-balance dive-dancing is every bit the marvel it needs to be. And central to the love story, the star-crossed Maria and Tony of Vanessa Becerra and Joseph Leppek imbue the plot line with aching momentum. Leppek, here incarnated as a Polish blue-collar whose job seems to entail twisting lightbulbs into some kind of disco signage, delivered the Lydian “Maria” with a mild over-reliance on falsetto to pull through the top notes (that hideous tessitura, arranged for a crooning lyric-tenor who can belt operatically high while warbling like Rudy Vallee, is admittedly a wacko jacko nightmare for most actors), although his “Something’s Coming” certainly fared” frameborder=”0″ allowfullscreen> better than some. Becerra, meanwhile, turned in a nubile Maria, clad in keds. The soprano, who portrayed Laurey in Glimmerglass’ Oklahoma! last year, is a fine actress: despite an occasional sharpness (most uncomfortably evident on “I Feel Pretty”), these foibles were redeemed by an earnestness we don’t see often in chaste, maidenly Maria. Of course what the audience always thrills to most is the high-kicking virago Anita, who, because she gets its best number, characteristically ruins the show for the rest of the cast. Who cares if your name is Chita, Rita, Debbie, or Karen: you win at West Side Story. This production was no different, boasting the spitfire presence of Amanda Castro and an “America” that brought the crowd nearly to its feet. The musical’s “third gang,” comprised of a generally racist and slovenly coterie of oppressive adults, is here incarnated as Lieutenant Schrank (Zachary Owen, also wonderful as Badger in Glimmerglass’ current run of Cunning Little Vixen) and the doddering Officer Krupke of Maxwell Levy. We also get a swish-o-rama Gladhand, the well meaning social worker in charge of the gym dance in Wm. Clay Thompson, and, as Doc, the lovable Dale Travis. Leading Glimmerglass’ top-shelf orchestra from the pit, music director and conductor (and proud Bernstein protégé) David Charles Abell expertly navigated the centenarian’s complex score, providing a lilting poignancy to the Somewhere ballet, with its nods to Beethoven and Tchaikovsky. But it’s the small flourishes that continue to delight: the hip thrusts of “Gee, Officer Krupke,” say; or the mismatched chest voice/head voice duet at the end of “I Have a Love”; or the diction groaners that are apparently not only inescapable but requisite for this show (by my stars, no one will ever equal the “Smoke on chor pipe and poot that in” of Tatiana Troyanos). “My hands are cold,” “Maruca,” “Cheeno hass a con,” “Oo-belie-oo”: neither Robbins’ despotic legacy nor Bernstein’s twilight weirdness can corrupt these moments for us, moments which, I must say, would likely sustain their power even if the authorities were willing to part with their show’s original appearance. Clearly, what this Story needs is a little shaking upke.